As a long time user of Silicone I have to say that baking mats and the ice cube trays are my favorite. Easy to use, easy top pop out ice, easy to store and easy to clean. I really like the bright colors of the Kuuk Silicone Ice Cube Trays. I always say it doesn't matter what color the trays are but bright colors are more cheery. These trays hold 15 cubes each. You can purchase the Kuuk Silicone Ice Cube Tray on Amazon. What Kuuk has to say about their product. Unlike plastic ice cube trays, which may contain harmful chemicals, ours are made with 100% BPA free silicone. This makes them safer to use for your family, so you can cool them down and heat them up without concerns about leeching chemicals and other substances. The unique molded shape of these trays creates perfectly square cubes every time. Just add water, place in the freezer, and take them out when your ice is done. And because silicone is naturally pliable, the cubes are easier to remove than with standard trays, which can be inconvenient to use. Just pop the cubes up and enjoy. These trays aren't just suitable for making ice. You can easily add your own chopped herbs and spices, sauces, baby food, and juices for perfectly portioned cubes when you need them. Just thaw before feeding, or add them to your favourite recipes during cooking. They also make ideal candy moulds for perfectly shaped chocolate bars and more. These silicone ice cube trays are dishwasher safe, so you can easily use them again and again. Just throw them onto the top rack and wash dishes as usual. 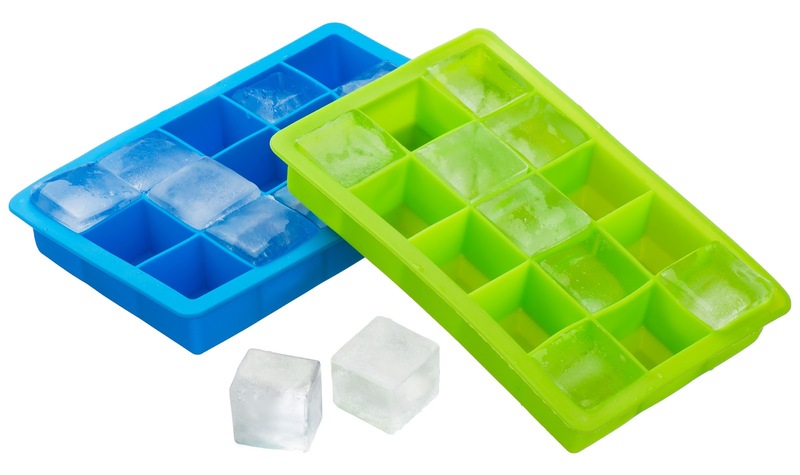 This two-pack of ice cube trays comes with one blue and one green tray for a stylish and festive look.